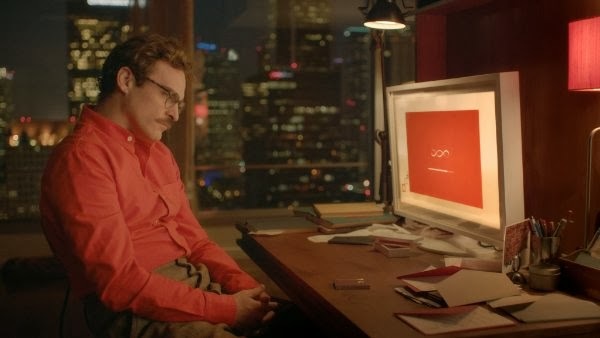 In Her, a man falls passionately and sincerely in love with his computer. As a society we have long passed the point of no return with technology: our smartphones, tablets, laptops and computers a virtual prosthesis storing our treasured memories, our tastes, our political opinions - even recognise our speech patterns and beginning to converse with us in an abstract and imperfect way. Her is set in a Los Angeles 10 or 15 years in the future, yet the notion of someone only able to find security, emotional connection and intimacy in technology is an issue very much of the now. 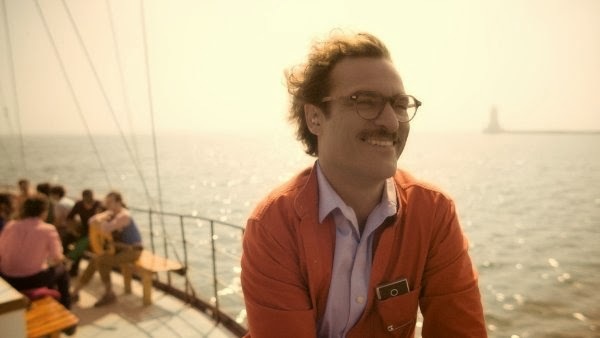 The centre of the film is Joaquin Phoenix's Theodore, a mildly depressed man who's in the process of being divorced by his childhood sweetheart. He works for a website called BeautifulWrittenLetters.com, which deals in artificial emotional intimacy, Theodore's job is writing intimate letters between lovers, families and friends, ironically weaving beautiful turns of phrase even as he's dead to the world. Though he can expertly summon up tender happiness for others he's incapable of doing so for himself, still numbly fixated on his future ex-wife Catherine (Rooney Mara). His perpetual broken heart begins to affect his personal life and so, in need of something to help organise himself, he buys a new type of artificially intelligent operating system able to converse, learn and analyse, all which adds up to a scarily accurate, if discorporeal, simulation of a person. Theodore names his OS Samantha, and equipped with the husky, best-friend/confidant/vaguely dirty voice of Scarlett Johansson she becomes a constant presence in his life, constantly helpful, always dishing out good advice and just plain nice to be around. Very quickly Theodore surprises himself by realising he's falling in love with Samantha, and she realises she's falling in love with him. 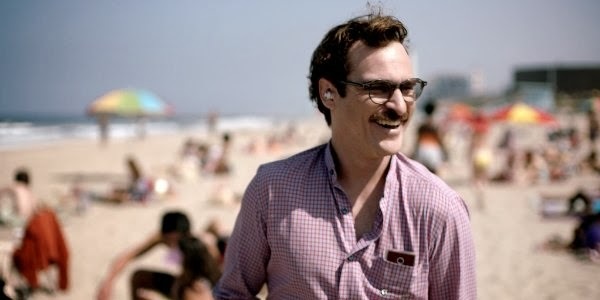 Much of what makes Her work is the admirably straightforward way in which Jonze tackles this central relationship. The central idea is inescapably high concept, yet Theodore and Samantha's romance is always sincere, nuanced and resolutely ungimmicky. There's the odd moment of levity as the lovers tackle the technological divide, but by and large this is a love story played dead straight. That we buy into this is testament to a very finely tuned script by Jonze, the sadsack gravitas that Phoenix brings to the role and the amazing voice-work by Johansson: even though we obviously can never see Samantha, we feel we know her very quickly. This is the core of the film, yet surrounding it is some of the most fabulously impressive production design I've seen in a very long time. Spike Jonze's 'tomorrow' Los Angeles is always absolutely fascinating to look at, a peek into a world that feels more concrete than practically every other cinematic future. The film really rewards close attention - quickly you pick up on the pastel, calming shades that renders this world welcoming and pliable - very subtly infantilising the people that live within it. Look even closer and you notice consistent future fashion amongst everyone on screen, wearing high waisted trousers, multiple layers of collars and vaguely 1970s influenced haircuts. Theodore, generally occupying centre frame, tends to wear a lot of red (visually connecting him to the setup screens for Samantha), which makes him stand out in this lived-in tech utopia. These little touches are the hallmark of intelligent and considered direction, something Her has in spades. Jonze works with a gentle touch, gradually seducing us rather than blowing our minds with overtly stylism, everything on screen primed to further the themes of the film. One of the most important aspects of Samantha's software is that she is able to learn, adapt and grow. Theodore thus functions as both father and lover, his view of the world influencing her development as he unconsciously teaches her about the world through the prism of his own experiences. As their bond develops we detect an uneasy tinge of co-dependency to the relationship, Samantha obviously developing into a person in her own right yet virtually shackled to Theodore; after all he bought her and ultimately she is his property. This crucial wrinkle in their relationship drives the rest of the film, Theodore ultimately playing King Canute as he realises he can't push back the tide of Samantha's growth. She begins to talk to other OSs, in one alarming scene revealing she's in conversation with 8316 other people, and in love with 641 of them. She introduces him to a virtual simulation of philosopher Alan Watts that she's befriended, clearly unaware of the weird jealousy this instils in him - competing with a dead erudite virtual philosopher is new romantic territory for anyone. During one distressing scene Theodore can't reach Samantha and panics with the pathetic impotence of a social media devotee unable to get online, exposing this relationship as a pacifier or comfort blanket - all the thrills of intimacy and closeness with none of the nitty gritty human misery that tempers a strong relationship. It's in the final third of the film where Her, unfortunately, becomes a little unstuck. The film shares close thematic resonance with Charlie Brooker's Black Mirror TV series, a series of individual stories about the logical conclusions of new technologies. In the episode Be Right Back a widow deals with her grief by signing up for a service that creates a digital replica of her dead husband from his activity on social media - a replica which initially fills an emotional void but soon occupies a disturbing, 'uncanny valley' half-life between life and death. Be Right Back has a haunting Twilight Zone bite to it that Her lacks and I crave. After a hugely promising and focused start, Her eventually devolves into vague and fluffy self-help. I'm not a cynic that shies away from happy endings, though I can't deny that Her's ending nicely wraps up the emotional development of the characters, it left me a bit cold. Essentially the film swerves away from asking interesting questions about technology and moves into fuzzier, conventional territory, which consequently lead a vague feeling of disengagement. I wanted to like Her a lot more than I actually did. High concept, original and smartly constructed films like this are the reason I spend so much time at the cinema, yet as the chequered flag fell I was left unsatisfied. The spooky glimmers of transhuman relationships that drew me into the film are eventually discarded, leading to a disappointingly pat conclusion. Despite this, Her is absolutely worth seeing: a brilliant director firing on all cylinders and asking some timely questions about how we live. Unfortunately when it comes to the answers it provides, I didn't buy it. Her is on general release from February 14th.